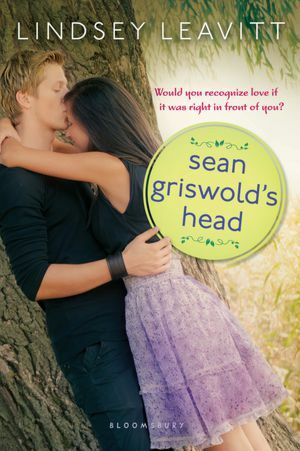 The lovely Lindsey Leavitt has graciously donated a signed copy of SEAN GRISWOLD’S HEAD, new in paperback, for us to giveaway! If you’re not familiar with SGH, now’s your chance to win a free copy of a terrific book. While the title may sound somewhat grisly, the book is anything but. Fifteen-year-old Payton Gritas thinks she has her life under control: she’s a straight A student who even color codes her planner! But when she discovers that her father has MS, her normally organized life goes into a tailspin. To help her, the school counselor suggests she picks a focus object, and Payton picks–Sean Griswold’s head. This seems like a natural choice since she’s sat behind Sean for years (Gritas comes right after Griswold in alphabetical seating charts). As she studies his head (and him) she discovers all sorts of things she didn’t know about the boy she’s sat behind for years. Not only does the story include a cute romantic story line, but it delves into Payton’s struggle to accept her father’s illness in a realistic way. The side characters (including Payton’s quirky friend Jac) add a nice humorous dimension to the story. In Leavitt’s hands, what could have been a fairly dark tale of Payton’s dad’s MS becomes a sometimes funny and frequently coming of age story. SGH has received several impressive awards and nominations: YALSA Best Fiction for Young Adults 2012, Kentucky Bluegrass Award Nominee 2012, Scholastic TAB Book Talk & Book Club Pick, Utah Children, Beehive Book Award Young Adult Nominee 2013, and a 2011 Whitney Award nominee. To enter the giveaway: leave a comment on this blog post. You can get additional entries by tweeting about the giveaway, posting on your blog, or posting on facebook. Be sure to indicate what methods you used in your comments. The giveaway will close one week from today: Thursday, September 12, at midnight. In the meantime, you should check out SGH at your local library (or buy your own copy! )–and while you’re at it, check out Leavitt’s Princess for Hire series (a charming–literally–series about Desi Bascomb, a middle-school student whose magical abilities enable her to substitute for real-life princesses). Oh, pick me, pick me! 🙂 I'm doing a book giveaway on my blog this week too (love giveaways!) if you want to stop by. I am a huge fan of YA and write reviews on goodreads, amazon, my blog and facebook about everything I read, so I'll be sure to put out some free pub on this novel if I win! I'd love to win a copy! I loved Sean Griswold's Head! Such a great guy. Such a great book. I would love to own it. Oh, I suggested this at my library, but, alas, no luck. I'd love to win a copy! Thank you for the giveaway! I'd LOVE to win this book. I'm a 7th grade English teacher and I LOVE to promote quality YA Lit!! I also shared on FB. Thanks! Looks like a good read! I'd love it! Hadn't heard about this, but glad I have connections with good taste!